Polar bears, the beautiful white creatures that filled the winter landscapes from our favorite books when we were children might soon become history due to the accelerated global warming. A photographer that was recently on an expedition in the Arctic took a photo of one of these bears and it was far from looking as chubby and energetic as we imagine all polar bears are. This one was incredibly skinny, and obviously undernourished. The fact that polar bears are starving is no breaking news. A study that was published a couple of months ago pointed out that the bear population is decreasing at such a fast pace, that all of them are likely to perish by 2050. This particular photo that soon became viral was taken by Kerstin Langenberger, who is a nature photographer that went on a trip to the Svabald, in Norway. The tourists who want to see the polar bears in their natural habitat usually go there because the area is very accessible. 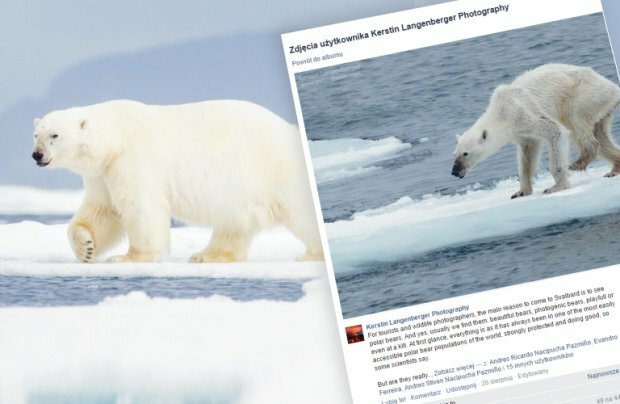 According to the photographer, climate change is responsible for the bears’ inability to find food. The most affected ones are the females, which need to take care of their cubs and find it difficult to search for seals or fish to feed on. Because ice caps melt and become smaller by the year, more bears are stuck on land and are unable to reach the places where more food would be available. Even if they are great swimmers, they need a great deal of strength to swim long distances and hunt. Obviously, that strength needs to come from food, which is scarcer every year. Her photo depicted a female which also had an injured leg and was desperately trying to catch a walrus. However, even if there are a lot of skinny bears out there, some experts say that people should not jump to the conclusion that all polar bears look like that. The skinny female bear was most likely old and her weight loss might be largely due to the injury she suffered on her leg. “I don’t think you can tie that one to starvation because of lack of sea ice,” said Ian Stirling, who is an adjunct professor at the University of Alberta and has been studying polar bears for over 40 years.